Dr. Earl Tilford is a retired professor of history at Grove City College. He also is an Academic Fellow with the Foundation for the Defense of Democracies and holds a White House appointment to the U.S. Army War College’s Board of Visitors. Dr. Tilford also serves on the Editorial Advisory Board of Vietnam magazine. 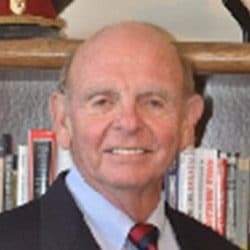 He is the author of three books on the Vietnam War, including A History of U.S. Air Force Search and Rescue Operations in Southe ast Asia, 1961 – 1975 (Center for Air Force History, 1981) which was nominated for the Furniss Award “Best First Book in Military History” Award. He also published Setup: What the Air Force Did in Vietnam, and Why (Air University Press, 1991); and Crosswinds : The Air Force’s Setup in Vietnam (Texas A&M University Press 1993). Additionally, with historian William P. Head, he co – edited Eagle in the Desert: Looking Back on the Persian Gulf War (Praeger, 1996). He has published more than fifty articles in referee d journals as well as numerous book reviews. Prior to coming to Grove City College in 2001, Tilford served as Director of Research at the Strategic Studies Institute, the U.S. Army’s strategic research institute charged with looking twenty – five years into the future to approximate the strategic paradigm and then recommending force structures, strategies and weapons systems that might best – fit future national security requirements. From 1969 to 1990, he served as an Air Force intelligence officer with tours in Vietnam and at Headquarters, Strategic Air Command, where he was a nuclear targeting specialist. During his Air Force career, Tilford also served on the faculties at the Air Force Academy and the Air Command and Staff College and was editor of the Air University Review, the professional journal of the Air Force. He was voted Air University “1991 Professor of the Year” and in 1992, the Air Force Association gave him the “General Hoyt Vandenberg Award” as Air Force Educator of the Year. At Grove City College, Dr. Tilford taught courses in the Humanities core, US Military History, Russian History, World Wars I and II, the Vietnam War and US National Security. He frequently appears on the History Channel and is a frequent commentator on national security matters on National Public Radio as well as a variety of radio talk shows.